The official weigh-ins for “World Series of Fighting 15: Branch vs. Okami” took place Friday inside USF Sun Dome in Tampa, Florida. Three championship affairs were supposed to headline Saturday’s show. 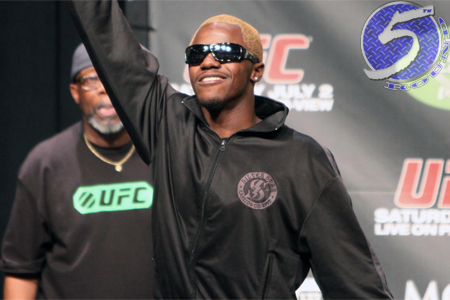 Melvin Guillard (pictured) came in an absurd 3.8 pounds heavy for his lightweight scrap against champ Justin Gaethje. Guillard, who claimed earlier this week he was an A-level fighter, wasn’t able to make the 155 pound limit for a lightweight title tilt despite getting two additional hours to cut. All other champs and challengers hit their required marks. NBC Sports broadcasts tomorrow’s fights live starting at 9PM ET/6PM PT. # – Zuckerman needs to lose 2.4 pounds. WSOF didn’t state how long he has to make weight. * – According to ESPN.com, 50 percent of Guillard’s purse will go to Gaethje.